I did go to church today. Twice, in fact. How goofy is that? I'm trying to find some place to attend regularly because.... Well, because. For church I dressed it up a bit and went with a full-on suit. Yup, the pants matched the coat. Clever, eh? I got the suit at Dillards which is a department store. I honestly don't know how widespread they are. The brand is Austin Reed. Not that I know what that means. It's a navy pinstripe that looks pretty keen, I think. It's the only three button coat I own. I went with a basic blue spread collar dress shirt. The necktie is the one I bought with the suit. It's a burgundy color with blue goemetric shapes on it and some white too It is a Roundtree and York by brand name. This is the first time I've worn the conglomeration with anything other than a white shirt. Fancy that! Oh, and I tied it in a half Windsor knot. It's too bulky a tie to go with anything more than that. 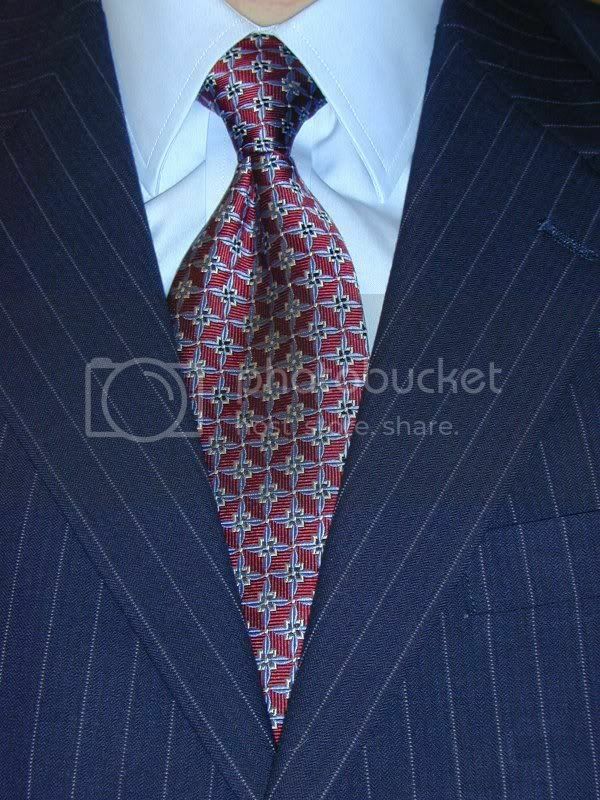 Personally, I think all ties are too bulky to go with a full Windsor. But that's just me. Michael Irvin would probably argue that but at least my neckwear ends up being the proper length after it's knotted. After the second service I took a new suit that I just bought to get it all measured up to fit me. It's a pretty expensive Jos A Bank number from their Signature line. The original price was about $800 but I got it for about $150. It's a charcoal pinstripe and I can't wait to wear it for the first time. Problem is that it won't be ready for another two weeks or so.